Google rolls out 2 step verification method for their all users,that's gives an extra layer of security to all google accounts. 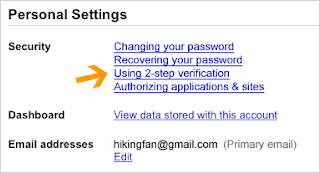 What is 2 step verification method? In this method google verify your account ownership using 2 steps,one from your username and password and another is from your phone. Why 2 step verification is require? Their are many cases happened on Internet (like "Mugged in London scam" )that people gets their google accounts hacked.Some mastermind hackers guesses your account password or they find it from another hacking tricks and they use your account ,but if you using 2 step verification than they require your phone also to login your account and it is nearer to impossible. How to use 2 step verification method? step 1: First of all you have to go your account setting page, there you can see 2 step verification link,click on it . Now if google enabled it to your account then you redirected to setup process either you can see below message. This is an advanced feature. 2-step verification for this account will be available soon. so you have no worry about it google will enable it later on your account. step 2: Now go to any google product enter your username and password and you will next redirected to enter verification code which you will get from your mobile phone. You will only do this once every 30 days if you so choose. When you turn on your 2 step verification than all non-browser applications where you use your google account will stop working,you will than have to sign in using special password you generate for this application,you can do it by going here. 1) a phone That usually available to you when you sign in. 2)A backup phone that you can use if you lose access to your primary phone. You can also turn off 2 step verification by visiting this link.